Round1 Unlimited Time Play : Good Deal or Not? Round1 Bowling and Amusement is a fun place with lots of ways to spend some time… and your money! During a recent visit, I wondered when does it make sense for an arcade/game player to play using “Unlimited Time Play” versus playing by game credits. There is a lot of factors to consider here, but here is my perspective. This calculation is based on charges I saw posted on October 27, 2017 at the Round1 nearest me. Your location may have different rates. But I will show you how do this step by step so you can determine this for your situation. First, I am going to assume that you are a frequent player and that you signed up for the “Club Card” which costs $5 per year as of today. I will ignore that $5 to keep things simple. Let’s look at the cost of game credits first. At my location, the sign said the “Best Value” was to purchase 150 credits which costs $29 with the “Club Card”. That works out to $29/150 = $0.193 per credit. 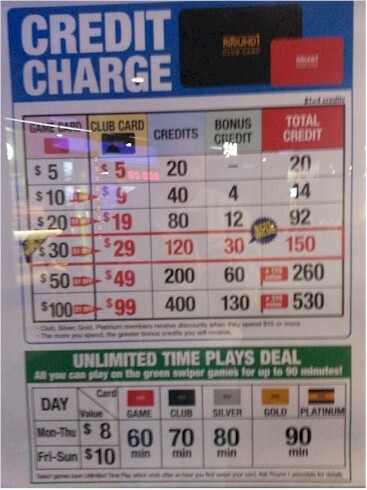 (Not sure how Round1 determined that $29 per 150 credits is the “Best Value”. The $49 for 260 credit = $0.188 as well as the $99 for $530 = $0.187 credits work out to be less cost, but lets just trust Round1 for the moment and move on). Now suppose your favorite arcade game requires 4 credits to play and that typically you get 7 minutes of play time on the machine for those credits. If you were to play for 70 minutes, you would play 70/7 = 10 rounds. This would require 10*4 =40 credits. Your total cost for this period would be $0.193 * 40 = $7.73 . You may ask why did I pick 70 minutes? Because if you play Mon-Thu with a Club Card, you can purchase 70 minutes of Unlimited Time Play for $8 at my location. So, with the above assumptions, if your average time per round on a 4 credit machine is 7 minutes or more, it makes more sense to play using credits. But, if your average time per round is less then 7 minutes, it makes more sense to play using unlimited time play assuming you don’t mind playing back-to-back games for 70 minutes. Here is an Excel spreadsheet you can use to determine where the break-even period is for Round1 rates. I hope you have as much fun at Round1 as I do ! All content on this site is for educational purpose only. The author is not responsible for any consequence or loss due to inappropriate use. The articles may well contain mistakes and errors. The numbers used might not be accurate. You should never use these article for purposes different from the educational one. Electronic devices can contain high voltages that can kill you. Algorithmic trading is risky and you could lose all your money. Playing Sports Fantasy is considered to be gambling in some jurisdictions. If you are a problem gambler, seek help.